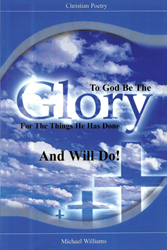 “To God Be The Glory For The Things He Has Done And Will Do!” from Christian Faith Publishing author Michael Williams is a fascinating book of poems that are inspired from various Bible verses and centered on different aspects of God’s greatness in a person’s life. “To God Be The Glory For The Things He Has Done And Will Do!”: a delightful poetry book on the things a Christian can learn in his or her walk of faith. “To God Be The Glory For The Things He Has Done And Will Do!” is the creation of published author, Michael Williams, a minister who reaches out to the lost through his poetry. Published by Christian Faith Publishing, Michael Williams’s new book clearly speaks of the sins that people usually commit and the challenges that they face on earth, as well as God’s everlasting love for everyone who believes and stays faithful. Williams’s poems are simple and precise; readers will find this poetry book as an easy and enjoyable read. It is written with an engaging tone, encouraging and moving each person to hold on to the hope that only God can give. View a synopsis of “To God Be The Glory For The Things He Has Done And Will Do!” on YouTube. Consumers can purchase “To God Be The Glory For The Things He Has Done And Will Do!” at traditional brick & mortar bookstores, or online at Amazon.com, Apple iTunes store, Kobo or Barnes and Noble. For additional information or inquiries about “To God Be The Glory For The Things He Has Done And Will Do!”, contact the Christian Faith Publishing media department at 866-554-0919.